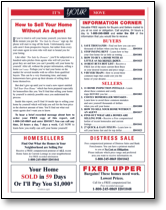 For most agents, "follow-up" is almost as dirty a word as "cold-call". Follow-up is a necessary step in the conversion of a prospect to a client, but it doesn't all have to be mauls drudgery. 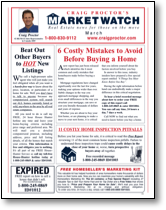 Your personalized 2 page monthly MarketWatch Newsletter will maintain regular and automatic contact with your prospects, accomplishing three very specific goals. It allows you to give your prospects regular, reliable and relevant information that gives you "top-of-mind" consciousness.. It gives your prospects plenty of opportunity to further themselves.